Welcome to our 19th episode in our newer podcast series where we cover everything related to investing in tax-delinquent real estate. As a husband and wife investing team, we’ve done nearly 3,500 deals – in land and houses – with little competition and big profits. And we want to share what we know with you. In today’s episode, we’re giving you lists. Not seller lists… no, no… lists of items to help you run your business smoothly. We’re talking about all the tools that we use to ensure our business runs as efficiently as possible. We’re covering websites, CRMs, apps, communication tools, software, books, even travel and car rental info..
You need these tools to operate and function for it to be a top-notch business. After all, a business is a business is a business, right? Jack: …Because we’re also asked or a typical question I always get is like, “What books do you read right now?” So, we’ve put together a list of them, and we’re going to go through them right now. As a matter of fact, I’m going to go through them, and Michelle is going to join back in a little bit later. Is that okay with you? Michelle: That is just fine. Jack: All right, wonderful. So with that, before we get started though, I wanted to welcome you again to the Forever Cash Real Estate Investing Podcast. And, in real estate investing, it’s a business like any other business. And, in a business you have to have some structures, you have to have some communication tools, you have to have things like that, and that’s what we’re going to talk about today. Michelle: And, those mainly involved you going into an auction and actually bidding on an actual property or on a tax lien certificate. We’re actually talking about using similar lists, but really circumventing the auction process and getting to those properties directly from very motivated sellers, and we’re talking about properties with very high equity. Jack: Right, with high and usually with almost 100% equity. The only thing that they owe is the property taxes. So, instead of going to these auctions where there is a lot of competition, where there is prices are being bid very high, or to these auctions where there’s liens being sold, and then you have to wait years before you can buy the property, in this, in our case, we actually circumvent these auctions, go directly to the owners, and the key is what lists to get. Now, to give you an overview about what we do, we have actually put together a quickstart course on tax delinquent real estate investing, and you can actually get that at my website or at our website, www.ForeverCashFreedom.com. All right. So, you can go to ForeverCashFreedom.com and download your free five-part course on… It’s all given to you all at once, on tax delinquent real estate and how you can make money with it. But, as I said earlier, a business is a business is a business. Michelle: Yeah, absolutely. And, if I can just add a little bit to the announcements is that we would love to hear from you, and we would love to hear if you like this podcast. Please give us feedback. You can rate us. Give us one star if you don’t like us, five stars if you like us, but in any case, we would like to hear your feedback and we would love to engage with you. So, we would love to have you visit our Facebook page, Facebook.com/ForeverCashLife and basically, ask us any questions you might have on anything that we say or cover during these podcasts, and we would be happy to answer your questions in ongoing future podcasts. Jack: All right, sounds good. So today, we’re going to cover tools, apps, websites, and books that I use to run my business. Basically, let’s start first with the tools. The tools are things that… Basically, productivity tools, efficiency tools, communication tools, because a business is a business is a business, right? Real estate business is not that much fundamentally different from running, I don’t know, a hair salon, right? Because, at the same, you still need to do certain things. You need to have customers. You need to have leads. You need to put advertising out there. We need to do that in our real estate to sell our land. We need to do that in any business. Then, you have customers that buy something from you. Then, you have to take care of them. You have a certain process to take care of them, and you also have a certain customer service to take care of them. You have certain products or things that you’re selling, whether it’s land, houses, or shampoos, or haircuts. It doesn’t really matter. So, the point is there are tools to make your life easier that allows you to communicate with your team members in a better way. And perhaps, I used a wrong example with a hair salon because a hair salon is still one of the businesses that are like brick and mortar in a sense where you have to be there in person to do this. There’s no such thing like a virtual hair salon out there, but let’s say in any other office, in any other business that requires office staff in the background. And, as a matter of fact, the hair salon might work too because there are hair salon chains that have a core office where people are also sitting and they need to communicate. They need to communicate with the franchisees, with the store owners, with the store managers, and so on and so forth, so it applies literally everywhere. So, here are some of the tools that we use to run our operations smoother, whether it’s a land flipping, whether it’s our educational business, whether it’s our property management, basically of our houses or whatever the business may be. First of all, you need a tool that allows you to manage your websites. Actually, not managing you websites, but managing your passwords is actually the thing. You probably have subscribed and signed up to a whole bunch of different places, right? If you have purchased perhaps one of our educational programs on the subject of tax delinquent real estate investing, then you know that you get a logon and a password. Now, the way we have designed it luckily is such that if you buy multiple programs, they are all being delivered to you on the same platform, and therefore you only need to have one logon and one password in order to get access to all of your courses, so it’s a simplified way to do this. But, at the same time, you probably have bought stuff from all over the place. You have a logon password for Yahoo!, a logon password for Microsoft or something, a logon password for Amazon, a logon password for your school, a logon password… You name it. There are probably dozens and dozens of logon passwords out there available. So basically, the simplest way is that you use a tool that manages all which is called RoboForm, all right? With RoboForm, you just go to RoboForm.com and you download it and you install it and you select the logon and password, and you need to remember only that logon and password. It’s the one that you do need to remember. Write it down somewhere, tape it to your computer or behind your computer, or put in your phone in a hidden place, but that is the one that you need and you probably don’t want to tape it to your computer because somebody could come in and steal it and steal all your passwords, but keep it somewhere safe. But then, you only have to keep one of them safe because that one of them gives you access to all of them, right? And, it’s very, very simple. I can actually show this quickly on how that works. Let’s go here. Let’s open another one and here for example, here is my RoboForm, I think. It becomes like a toolbar right on my screen, and with the toolbar, if I expand it here, I can see all. If I go here, I can see all my logons. Look at that. This is all logons that I have. So, it goes… Here’s where they end at ZipRealty but it goes from YouTube for logon, WordPress logons. I mean, there’s Hotels, Twitter accounts, US Airways. It goes to different kinds of things. There are multiple RoboForms. There are accounts that belong to. There’s all… You name it. I mean, literally everything… Gmail accounts. There’s Facebook accounts that I have. Everything is in here and there are pages and pages and pages, probably several hundreds of them that I have, that I all organized through RoboForm. RoboForm is like $49 bucks or something like that. It’s like almost nothing and it really saves your life. Then, what I do is… The second one that I use is Evernote. So, when I go into a meeting, I use Evernote because Evernote is a beautiful tool that synchronizes notes between different computers. So, instead of having a notebook, or sending myself an email, or having pencil and having paper… I mean, I love paper. I still print out stuff and read it, but for notes, I no longer use paper because I know that paper is going to be dropped somewhere, coffee is going to be spilled on it, or it’s going be lost and I leave it behind somewhere, or it’s going to be thrown away by the cleaning lady by mistake, or whichever way it is, it’s going to get lost. But in Evernote, nothing gets lost, so you sign up for Evernote. It’s actually free, and then they have a $10 a month option that has advanced possibilities. But, even if you use the free one, I think you can still use it on your computers, install it on your computer, but also install the app on your phone, and then you logon to both of them. Save your logon, of course, in RoboForm so you don’t forget it, and then when you’re taking new notes on your phone, when you get to a computer, the notes are already there. You can record audio and attach audio to your notes, and it’s already synchronized on the other part. And then, she can go into Evernote and search for that note. All right. I can also show that. Evernote is actually right here. And for example, this is my Evernote, and here’s all the notes that I have taken. And, you can see some of these notes actually have pictures on them. Some of these notes are pictures of a piece of land that I’ve been looking at, so you can take these notes and close them, and actually look at them and keep them here as a picture. There are audios that I have here as a note. There are notes with a picture in between of a little or something we… So, even if we did something on paper, I now actually take a picture of what we did on paper, and therefore I have a record of it. Last year, last week, or a couple of weeks ago, I was at an event with MIT, the Massachusetts Institute of Technology in Boston for four days in a training course associated with MIT and an organization called Entrepreneurs Organization. So, for every speaker that came up there, I did a separate note and now I have multiple places that I can actually look that thing up, so I really like it and it’s very good. Then, another tool is called Podio. Podio is our internal communications tool in our company. So, we centralize everything we do now on Podio. That means that if I… For example, if something happens at our company and somebody wants me to do something, yes, they can send me an email. But, even easier, they can drop it into Podio and trigger a notification to me that there’s something waiting in for me in Podio that I need to look at. Then, I have Podio also on my iPhone as a Podio app, and I can always look at it. We use that to some degree for certain types of deals. We use that for certain kind of things in our educational business, or when I coach in our coaching program or deliver a coaching session, they take their notes into that so that I can look into the system and see how the call went, and I even attach the audio of it so I can listen to it. So, it’s a managing tool, but it’s also a communication tool between different people. You can even do certain workflows built into it. So, it’s a very, very cool tool to use for that task. Then obviously, we use a tool that is called the Investment Dominator, which is really our deal maker or deal management software. So, we use that for our land deals, for house deals, so many of our students use that. And, it’s currently not open to the public unless you specifically ask for it. And perhaps, if you have one of our courses already, and you’ve already done some deals so perhaps we allowed you to use it. Or, there’s another way that you can access this, and if you’re interested in accessing our really cool build-out software that helps you to mail merge, helps you to send mail letters, helps you make offers, has a built-in buying and selling website, has built in… All kinds of functionalities, reporting functionalities, then you can just simply call (602) 712-0182 and we potentially can get you access to it. Then, we use another tool that’s called Dropbox. And, Dropbox is a tool that many people know and lots of people know. And, Dropbox is really cool because it basically gives you something like a Windows Explorer. It gives you something like a hard disk, just that this hard disk is not on your computer. Actually, it is and it isn’t. It’s the same thing, it’s the greatest part about it. So, we used to have a server in our office where on that server, we had all our files. And then, we used to have additional tools, an additional thing where we used to put this kind of like, almost like capsules. It’s kind of like a hard disk, hard drives, and we place them all in there, that would back up what’s on the server so that if the server goes down in the middle of the night, or it breaks, or if there’s a fire or something like that, we would still have a back-up. And, we used to have multiple backups, and one of them, one of our team members would take home everyday, so that in case the office burns down, our data is still there, because our files are there, our past is still there, and so on. So therefore, that’s what we used there. For example, to not have certain data that’s not synchronized with other computers, because by default, if you put five people on the same Dropbox account, then if somebody uploads something, it immediately gets synchronized to all the other computers so there’s a double backup. Because if one computer goes up in flames, all the data that was on Dropbox for that computer is on the other four computers, and it’s also backed up in the cloud. So, it was really cool to do this and you can select which of your folders in the Dropbox is being synchronized to other people, and which one is only synchronized between you and the actual cloud. So, it’s really cool because it gives you double back up, and it’s actually almost for free. It’s almost for free. It is literally just… It actually is for free up to like 50GB or so, and afterwards it’s very inexpensive to do this. Then, of course, we use Skype. We do a lot of Skype in between our different team members, so we have team members that work in the Philippines. We have team members that work from home a lot. We have team members… I work from my home office about two to three days a week. So, through Skype, we can see each other. We can do Skype conferences. We can do Skype group texting. We can do Skype one-on-one texting from your computers and that works well. And, of course, Skype also has the app, so if you have to jump off the computer and go into the car or drive somewhere, you can take Skype with you, and of course I don’t text and drive, but if I’m at a traffic stop, or if I’m in a red light, I can very quickly pull it out and continue communications if I need to. Or, if I’m waiting at the doctor’s office or something like that, I can if I need to send a message to my teams or actually talk to them over a Skype phone, or talk to them over… I mean, I can also obviously call them, and that’s another way. Then, RingCentral is along the same lines. RingCentral is actually a voice over IP telephone solution that is extremely affordable, extremely flexible and extremely cool. So, we have one of our team members that lives and works in the Philippines, and she has a smart phone, and on the smart phone, we have set up RingCentral for her. We configured that for her. Actually, she configured it for herself based on our instructions, and now sometimes when you call in, you might be routed to Ivy in the Philippines and Ivy picks up. She’s under the extension, whatever it is. I don’t want to disclose right now, but she’s on an extension just like we are at an extension. So, there’s no difference even though she’s around the world. And, she’s plugged into a Wi-Fi center, and therefore pretty much most of her telephone calls are basically free or at a very minimal cost. And then, since I travel quite a bit, either for personal or for business of for education purposes or with the family, I also like to use some of these travel services. Actually, travel places to look up stuff, and I find that one of the best websites and actually apps also to look for travel clothes is KAYAK. So, I use Kayak for that, and Kayak is a great app. It’s very easy to use and it gives you lots of things, flights, hotels and so on. It’s really phenomenal and very easy to use. And then, whether I buy… Actually, I typically don’t buy my flights or hotels through this kind of travel apps, because if something goes wrong, you are now dealing with that company instead of dealing with the actual provider of the flight or the provider of the hotel, meaning the hotel company or the flight airline, you’re dealing with Kayak or Travelocity, or you name it, whatever with all the other different websites are. So, I just use basically maybe Kayak to look up flight combinations, and then I actually call my travel agent, or I go directly to the airline and book it there. All right. So, the favorite apps I use. Well, again for travel, my life has been changed and travel has been made so much easier ever since I use the app TripIt. And TripIt also, of course, is a website. You can go to TripIt.com and that’s probably where you want to sign up. TripIt is really, really cool because TripIt has figured out how to read those automatic those automatic confirmations from the different travels that you do. So, if you book yourself a flight ticket, you get a flight confirmation. You book yourself a hotel, you get a hotel confirmation, and TripIt really figured out how to automatically read them and put them into an online itinerary for you. It even allows you to online check in through the TripIt app, and it’s free. So, still to this day, I use the free app. The Pro app costs again like something per month, but I haven’t had a need to use it yet. The additional features that the Pro ones provides are not really something that I use so much that it’s worth it. Then, I also use an app in conjunction with Dropbox. I also use DropVox, and DropVox is a cool app. It’s again a super easy app to use. It literally just has one button on it. So, you bring it up and there’s one red button. That means record, and then once you press it, it turns blue or something. You press the blue button, and then it stops recording. And, what you do is when you set up the DropVox app, you connect it to your Dropbox account. So, DropVox to Dropbox, so V connects to B, right? Vox to box. And then, you designate a folder within your Dropbox with B where the thing should go, and then the cool part is as you drive around or walk around or as you sit on the couch, if you want to record yourself a memo, you can just speak it into DropVox, with V. You pull out the DropVox app. You press the red button. You start speaking as long as you want, then you press save. Or, if you’re in a meeting and you want to record something, you record it and when you’re done, you press done and it automatically will upload the recording onto the specified drive on Dropbox. And boom! It’s all been taken care of, so all of a sudden, the exact instructions are being done. It can also be used to, for example, write a book. Like, when I wrote my book, Forever Cash, I did a lot of it through audio. I recorded myself speaking an entire chapter or at least the main points of a chapter onto my iPhone, and then had it be uploaded to DropVox, and then had the person that was helping me to smoothen it out and make it into better English, and actually take it from there and just take the file, open it, listen to it and go from there. So, it’s a really cool tool for that too. Then, of course WhatsApp. WhatsApp was sold to Facebook, I think, for like $16 or $17 or $19 billion, and it’s like something like a few billion cash that are in stocks, and now the stock of Facebook is way up, so the guy that sold it really kind of made $28 billion for selling of WhatsApp. And, WhatsApp is basically a place that has almost, I think, 900 million. Almost probably by now, there’s perhaps a billion people on WhatsApp, and basically it’s a text messaging app. And now, we can actually do even video chatting through WhatsApp, so it has started to compete with Skype on that quite a bit, and a billion people around the world use WhatsApp. And, it’s a really cool system in the U.S. It’s popular, but it’s really, really popular in Europe, because in Europe early on, the cell phone providers would charge people 50 cents for each text, and people are like, “I don’t want to pay 50 cents for each text because you know how fast 25 texts can go through, right? Especially like with my wife back and forth, it’s like, “Hey, can you pick up our daughter from school.” It’s like, “Yes,” and then, “Oh, I want to tell her something. I’ll just text her quickly.” And, all of a sudden, ten texts are gone. That’s five bucks. 20 texts is 10 bucks. So, these Germans said like… Or, the Germans said, and the French, and the Dutch and everyone… Obviously, I have a bigger relationship to the Germans. They’ve basically said, “I don’t want to spend the next item or how much for these text messages.” So, they came across WhatsApp, and in WhatsApp, you use the data part of it, and if you are in Wi-Fi, it’s for free. So therefore, everybody has Wi-Fi, everywhere in Europe just like it is in the US, but over there, there seems to be more places with free Wi-Fi. And so now, everyone texts everyone else through that data and network for free, and it’s really cool and has become very popular in the U.S. of course too. So, we use that… I use it more personally a little bit. I use it with my family in Germany, with friends, with my wife and so on. But, Voxer is another one that we started using with our coaching students for example, because Voxer is kind of like a walkie-talkie and a voice chat app. So basically, it allows you to… And, by the way, if you see in the bottom right, just a little thing came up. It says “synchronization complete.” By the way, that is Evernote. Evernote in the background constantly synchronizes things, so if you change something on Evernote, it synchronizes it immediately, so if my computer goes up in flames, it’s not an issue. But back to Voxer, Voxer is a really cool app which allows you to just press one button, speak into it, or actually you go look for the person you want to speak to, and instead of calling them, you press the button, you speak a message on it. The message can be five minutes long or 10 minutes, as long as you want really, and then you press send, and then again it sends them that message and sends a little notification, and they, at their convenience, can now listen to that message and send you a message back. It also has a walkie-talkie functionality that if most people want to do walkie-talkie, you can literally do a data, press the button and say something. They hear it and then they press the button. It’s really cool, and again it’s free. Then, of course, Skype. As I mentioned already, we use the Skype app that’s hooked into or that’s in the same account obviously as in the computer. So, even if I’m somewhere there… One time, I was out in the field, I took some pictures of a commercial property that I was buying and I had an appointment with my brother. So, I just parked somewhere, went on Skype and had a conversation nicely with my brother. That only costs me a little bit of data, and I happen to have unlimited data on my phone. So now, Facebook obviously, we use that two-way. We use it to communicate with some of our customers. Also, that’s why I would recommend everyone listening to this; please find us on Facebook.com/ForeverCashLife for our Forever Cash source. So, for example, for the podcast, you want to definitely follow us at ForeverCash.com/ForeverCashLife. Other than that, you can also follow me, Jack at Facebook.com/Jack.Bosch. So, it’s Jack.Bosch. That’s me, and you can find us there. And then, a couple of other tools that I’ve just started to find out about, and one of them actually or the one that you just see there is called Silvercar. I just started a presentation about Silvercar from the founder of Silvercar. And, it’s like a fireside chat with Q & A. It was really phenomenal. And, this is a really cool car rental company where all they have is silver Audi A4s. So, that’s all the cars they have. And, they rent them for between $49 a day and $89 a day, and in many markets, unless there’s really something crazy going on, it’s $40 or $59 a day. So, it’s very similar to the cost of a regular rental car. There are only ten markets right now, but they are expanding rapidly, and it’s very similar to the cost of our regular rental car, and there’s insurance and all that kind of stuff included. It’s basically the simplification of car rental. They pick you up at curb at the airport. They bring you basically the car rental facility but only for the guy that pick you up to get out of the car. So, he gets out of the car and you can continue driving. When you come back, you don’t have to fill up the gas. They electronically measure how much gas you used. They automatically charge you for the amount the gas costs, not for three times the amount the gas costs and just for the actual cost of the gas plus a little service fee. The car has Wi-Fi built in, and it’s pretty much a brand-new Audi A4, so you don’t have to ever think about what I am going to get. Am I going to get a crappy car? No, you get an LED silver Audi A4. So, it’s really cool. I can’t wait to actually use it because it’s an efficiency tool at its core. And, its core is not about getting a silver Audi A4 which is a nice car. At its core, it’s about using your time more efficiently. If you run a business and you are serious about your business, then your time is the number one resource that you have, and the number one most important resource that you have, and the number one most scarce resource that you have. So therefore, anything you can do to minimize the time that you spent on stuff that is just unnecessary is really well used time. So, I’m gladly willing to pay $20, $30 more a day more on a rental car if I don’t have to go find a rental car place in the airport, go get in the bus, go get out of the bus, stand in line for half an hour, then they don’t have the car that I want to. They want to upsell me to something. They want to pitch me 25 insurances, and then an hour later I walk out of there disgruntled and in the wrong car. I’m like in a car that’s not the car that I had booked. Versus with these guys, as I said, they pick you up at the curve. They bring you and they start driving right away. You just let the guy out, or let the guy out at the facility, and then you keep driving. So, it takes you five minutes, as I understand, to get that car and you know what you get. And, when you drop it off, you don’t have to find the closest gas station because otherwise they charge you $7.55 per gallon when their usual gas only costs $3 but you just go. It’s an efficiency tool. You just drive back up to the facility or to the airport to the place where the concierge meets you. You get off the car. You grab your stuff. Through your phone, you get your invoice, get charged right away to your credit card, and you are off to the gates. So, it gives you like a couple of hours more time on a trip. No! I go and look at OpenTable. “OpenTable, which of my favorite restaurants that I want to go to have a table available tonight?” And, if it’s a busy night, and only one of them is available, I say, “Great.” I say, “Hey, Michelle, Tommy Bahama.” Let’s say a restaurant we like here has an opening at 6:30 P.M. “Let’s go!” Boom! Booked. And, when we walk in there at 6:30 P.M., our table is ready. Again, it’s a convenient tool that doesn’t cost you anything. All right. So then, last but not least, I want to talk about a few books that I have in the book area. These are books I have divided into business books and into personal books. Now, the business book. Again, no business is large enough for the managers and owners of this business not to be consistently educating themselves. So, I always like to say that when you’re out of high school, then forced learning ends but learning just starts. Because in high school, in school, you have to learn what the teachers tell you to learn, a lot of which has absolutely no use for the outside world and for things. I guarantee that nobody listening to this right now has ever had a single class in “How do I Retire Financially Safe?” Now, even financial advisors don’t do that because they just learn how to sell stuff, right? And, often how to sell stuff and such that they make the highest commission, and who cares if the customer actually advances and makes a profit here? So, nobody has had a class about how to build wealth, so therefore obviously, my favorite book is Forever Cash by yours truly, Jack Bosch. And of course, that’s not a joke. I wouldn’t have written that book. I would take the book off the market if I wouldn’t think it would be a great book, and people usually love it. Now, it is not a “How-To” book on how to flip real estate. It’s not a book that gives you the exact details on how to get a tax-delinquent piece of real estate, right. Instead, what it is, it’s a book on my wife and I’s financial philosophy on building wealth, building wealth in a short time of three to five years, wealth that will last through a lifetime, and then will give you more income today than you had until… No, let me say it the other way around… That gives you more income in a few years than you have today, and those income will last for the rest of your life. Then obviously, along the same lines, I like Rich Dad Poor Dad by Robert Kiyosaki. Pretty much everyone read that. If not, it’s your duty to read this. Every employee that starts in my company gets two books. It used to be one book. Now, it’s two books. It used to be that they get only Rich Dad Poor Dad, but ever since I wrote my book, they get two books. They get Rich Dad Poor Dad and they get Forever Cash. Then another financial book is from Tony Robbins. It’s Money: Master the Game. It’s actually not off, just Master the Game. It’s a great book. It’s a big book, so if you don’t like reading a lot of books, I would suggest you get yourself audible.com, which by the way is another good app that you can get for your phone. Audible.com, that is A-U-D-I-B-L-E. It belongs to Amazon now, and you can go and download audio books. So, for example, “Money: Master the Game” is a 650-page book. Fine print, thin pages, it’s still a huge book. And, I have it and I’ve read through the first 100 pages and it was just too much. So, I went and got it on Audible and now while I work out, I listen to it. And then, if I need to, I can still open the physical copy and highlight a couple of areas. Then, the book I’m currently going through again in detail is Og Mandino’s “The Greatest Salesman in the World.” It’s a phenomenal book and really gives you the mindset of financial success, the mindset of sales success. And then, in terms of also scaling up a business and building up a business, the book that I like reading well a lot lately, very easy to read, very funny to read, is actually called “The Pumpkin Plan.” And basically, the premise of a “Pumpkin Plan” is how do you build a big business? Or, how do you build a big pumpkin? How do you grow a big pumpkin? And, the way you grow a big pumpkin is by focus. It’s by… You first plant the pumpkin and it’ll come with a bunch of vines. And then, there’s a bunch of pumpkins built or starting to grow on these vines. And, what you do is as they grow from tiny to about the size of an apple or so, you identify the one pumpkin that has the highest probability of becoming a monster mega pumpkin and you cut off all the other pumpkins around it. You just cut them off, cut off those vines, and basically put all year so that the plant can put all its juice, all its efforts, and all its growth into that one mega pumpkin. All right then, what else do we have? We have “The Outsiders.” If you are into a little bit more business thinking and in terms of like CEO kind of stuff and if you perhaps have a business already and you want to think… Or, if you are investing into stock market investing and so on, then read “The Outsiders.” It’s about eight unconventional CEOs who beat the market consistently. It’s a phenomenal book. I didn’t write the author’s name. I don’t remember right now, but if you just go on Amazon and look for “The Outsiders,” it’s a phenomenal easy-to-read book. It’s a fascinating book with eight case studies about CEOs who have consistently beat the S&P 500 by multiple times and accumulated over the years, sometimes by a hundred times and so on. So, there are people who always say Warren Buffet is a genius. He absolutely is, but they also say there’s no second Warren Buffet. After you read this book, you will disagree with that, because there’s at least eight other CEOs that have done the exact same kind of success rate that Warren Buffet has, and they all have multiple organizational management and basically principles in common, and they’re being outlined there which is why it’s a phenomenal book to read. And then, if you really like deep thinking and like really thinking about what the future will bring, this is a spectacular book. It’s not that easy to read, but it’s a spectacular book to read. It’s called, “Singularity is Near” by Ray Kurzweil. Now, Ray Kurzweil, if you ever do any kind of voice recognition, if you speak into Siri into your iPhone or into your other thing and let it recognize something, or if you type something, and then do the autocorrect and those things, Ray Kurzweil invented that technology. He’s one of those geniuses of the world. He’s now the head of engineering at Google, but at heart, he’s really a futurist. Bill Gates called him the most accurate futurist that he’s ever seen. It’s a phenomenal book to read. It’s based on his foresight and on his prediction. We all should be able to live until… Anyone that’s under like 50 or 60 right now should be able to live until 120. And basically, I think his number one concern though is literally how we can turn the machines off that are very soon going to be smarter than we are. It’s fascinating and a bit scary when you read this. And then, there’s a book that I really enjoyed particularly for people that are in a job right now or that are operating. They want to extend their reach and extend their… They want to accomplish something that they think is really difficult to accomplish. It gives a really good path on how you get something done in this world and how to basically not follow your passion, but how to build something up in a successful way and enjoy it and shows lots of examples on how to do that. And, it’s not kind of like the typical way. It’s actually hands-on in a very, very cool way. And, in essence, that’s what my wife and I have done in our real estate business. We first were… I had a job. I couldn’t quit my job at the software company, but we built our real estate business off at the… We built it up at the side. And then, only once we had it built up such that we had paid down our debt, that we build up an expertise, and that we had some money on the sideline is when I quit my job. And then, from then on, it went up very, very steeply, so it really resonated with me on that end. It doesn’t mean that you can’t also be a millionaire, but the focus is not the money. The focus is building a life that is a million-dollar life that you become a “Lifeonaire.” You become a master of living. And, you do that not necessarily by just making more and more money. Money is important, but they have a four-step process in there that shows how you can basically effectively live an amazing lifestyle, and have time for your friends and family, and at the same time make a bunch of money. So, it’s a very cool book. Again, without having known this book or before even having known this book, my wife and I pretty much lived the “Lifeonaire” lifestyle. And then, more spiritual books is… The other one is “Autobiography of a Yogi” by Paramhansa Yogananda. It’s a great book. For example, Steve Jobs, every time he went on vacation once a year, he took his iPad and on his iPad, there was only one book and that was “Autobiography of a Yogi.” He read this book every single year for I think like 19 or 20 years since he came across it, and at his funeral, everyone who had attended his funeral was given a copy of “Autobiography of a Yogi.” Very surprising about Steve Jobs, but not so surprising once you read it and once you know all about Steve Jobs. And then, I also like Eckhart Tolle. Actually, I like multiple things from Eckhart Tolle. “The Power of Now” is obviously his most famous book. Then,” The New Earth” came afterwards. But, he also has some really good audio books which are really recordings from three-day seminars that he gave which are very phenomenal, which I’ve listened to multiple times. All right. So, with this, that is the conclusion of our today’s podcast. Again, as a reminder, as Michelle said at the very beginning, she had to step out so I did the call today on my own. She mentioned we want to hear from you. So, go to our podcast and put in a review. I would love, of course, the better the better the review of course, but also rate us on there. Give us four stars, five stars, whatever the number of stars you really want to. Be honest. And, if you enjoyed, I would love to hear from you. 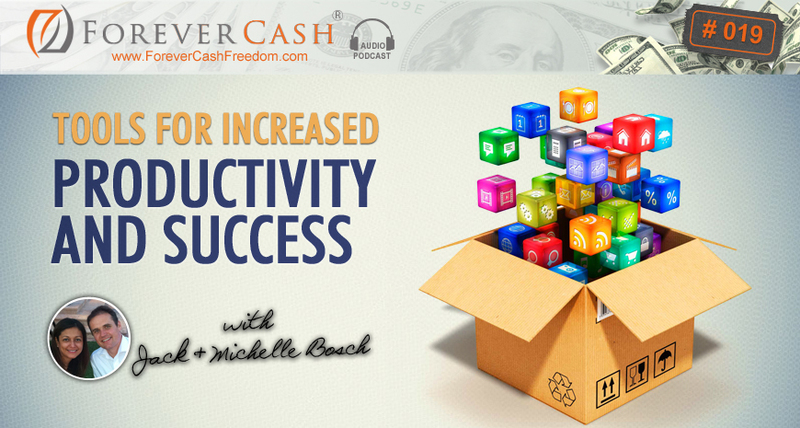 The other part then is of course as usual, the notes, the transcript of this podcast along with all the different links that I shared, all the different apps, all the different books, all the different tools that I shared are all available on ForeverCash.com/Podcast so you can look them up all there. And lastly, one announcement still, we have a live event coming up, a live educational event. And, if you go to www.ForeverCash.com/PodcastLiveTickets, and when you go there, you get a severely discount ticket for our live event. All right? Okay. So, with that, I say thank you. I’ll see you in the next week. We publish one of these podcasts a week, sometimes even two. So, subscribe to the podcast and we would love to hear from you again on our Facebook page and all those different places. All right. Thank you very much. Buh-bye.